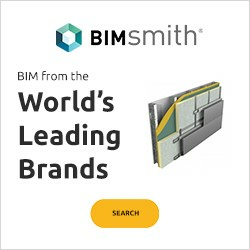 Revit 2019.1 was released on August 16, 2018. 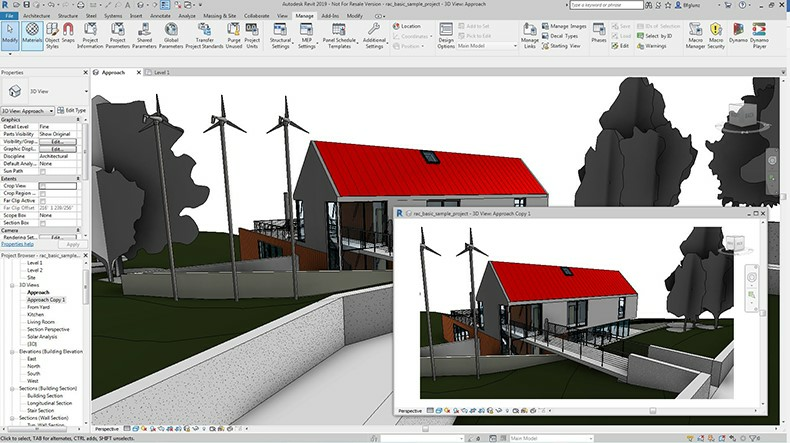 Read about the new features in Revit 2019.1 here. 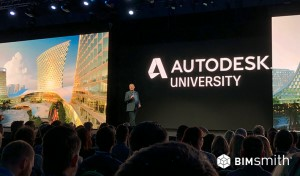 Autodesk released the latest version of its powerful, industry-leading modelling software yesterday, consistent with previous Revit releases that have been unveiled mid-April each year. The new release continues to hone in on optimizing user workflow, improving on a number of features from previous versions. The Jedi Revit Masters on our team have been playing around with the new Revit release like it’s Christmas morning, so we’ve got a pretty decent sample of first impressions. As might be expected from any update, the reviews are mixed, but on the whole positive. 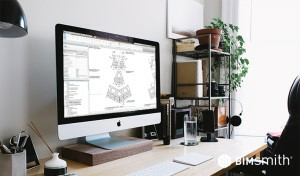 I sat down and took stock of what our Revit pros have to say about the new update, and compiled a list of what they seem to agree are the most notable features to Revit. 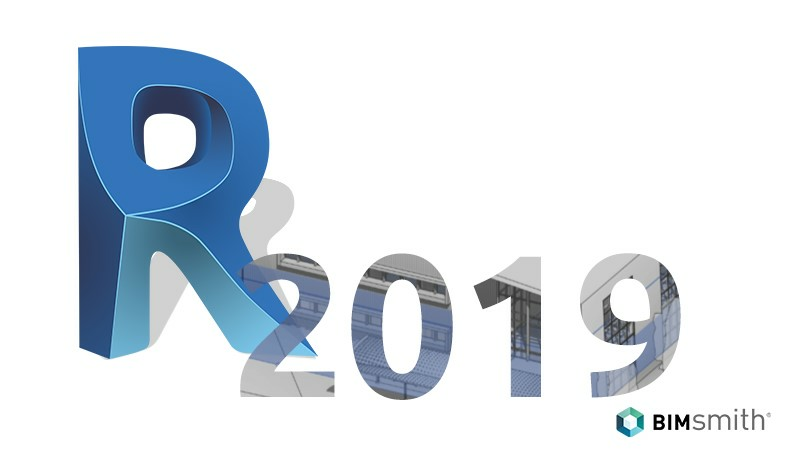 So here they are, our favorite new and updated features in Revit 2019. Apparently the #1 request by users prior to this release, Autodesk added the "or" variable when viewing filters. Now you can officially combine "and" and "or" to your heart's content. Or, perhaps more specifically, you can combine "or" and "and" and/or "and" and "or". Sorry, I couldn't resist. Don't think too much about it. It makes sense. Google Chrome, meet Autodesk Revit. That's right, we've got tabs now. Autodesk calls it a "more modern experience," which is probably an understatement. Regardless, it's going to help make the most of limited monitor space (can Autodesk get me more of that too? ), so we're on board. 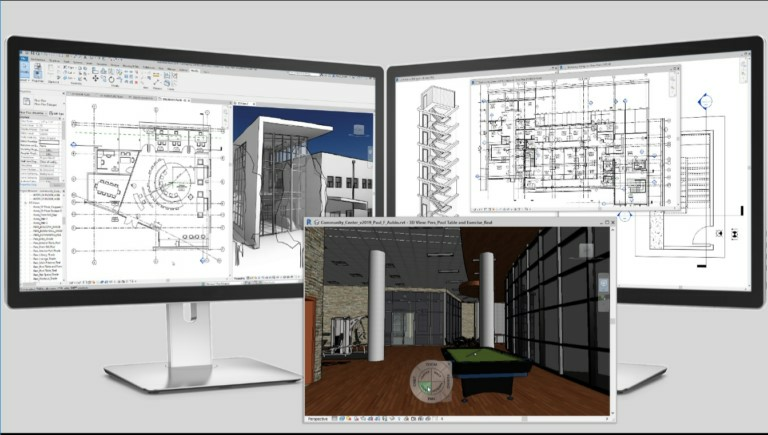 In close conjunction with the previous update is the exciting news that you will now be able to pull different views out of your main Revit window to use on additional monitors. It may not be an earth-shattering revelation, but it was a top user request and it's no doubt why. Small changes like these can do big things for productivity. Revit 2019 introduces new double-fill patterns, enabling you to quickly and easily combine foreground and background fill patterns for more complex graphics. Use these patterns on filled regions, visibility/graphics display overrides, object level overrides, and more. 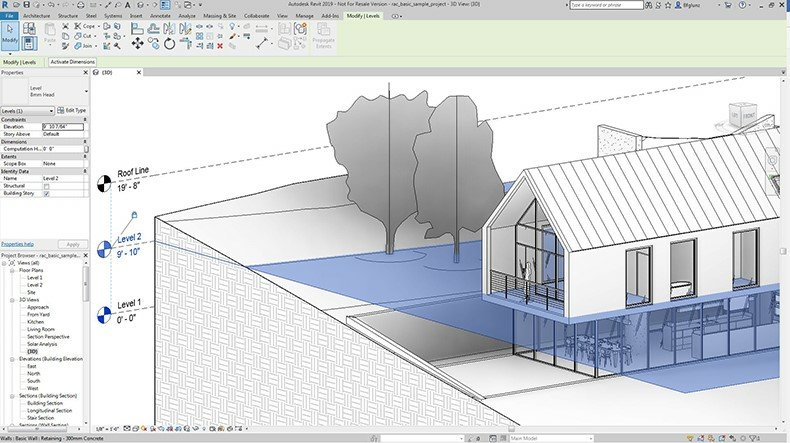 Revit 2019 has added a new feature to make it less cumbersome when working with geometry in 3D views. With the addition of Levels in 3D Views, users can now display and edit any level in any view. This includes perspective 3D and orthographic views. In short, there's now a lot less need to switch back and forth between 2D and 3D to orient your model. Revit 2019 also now includes uncropped perspectives. In previous versions this feature was simply grayed out, making it mandatory to crop perspective views. Uncropping the view allows the user to have a more immersive 3D experience without boundaries. 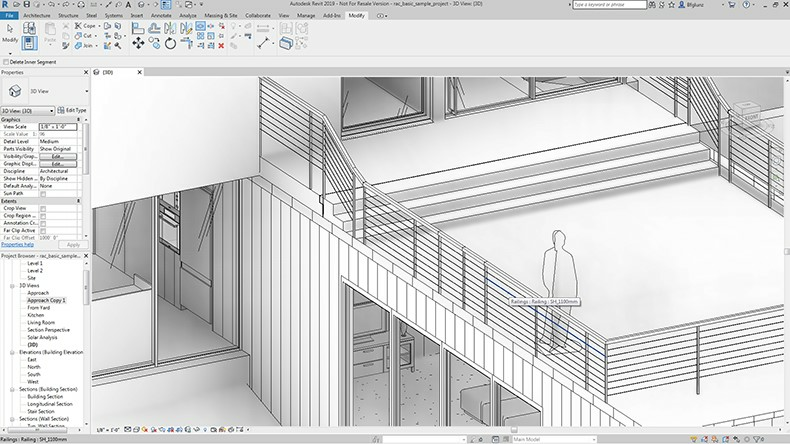 Revit 2018.3 made some updates to user control over railings, but Revit 2019 incorporates the Split tool to split railings with a single click. When you use this feature, the now disparate elements will have separate path sketches. This is a nice dose of simplified and enhanced control for anyone who has been frustrated with the railing workarounds of previous Revit versions. It's now quite a bit easier to model piping networks in Revit 2019. In older versions of Revit, leveraging these capabilities required significant understanding of connector configuration and typical pump setups. 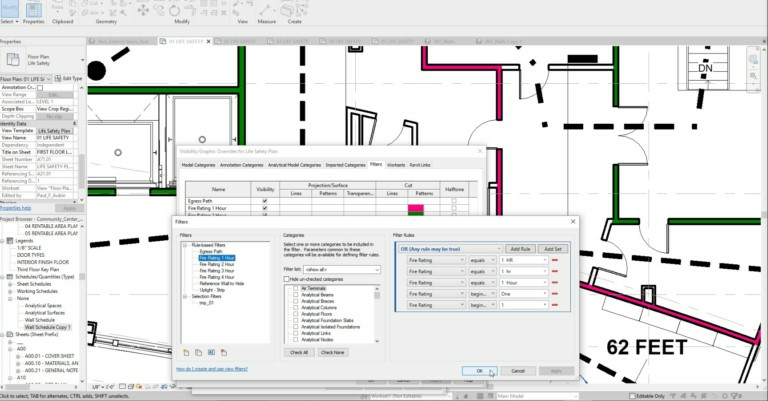 While that won't hurt you in Revit 2019, the new release makes it significantly easier for users with less experience to enable complex piping networks. "Revit 2019 has improvements to primary/secondary hydronic networks which enable modeling of much more complicated piping networks. These improvements include support for headered systems, hydronic bridges, as well as one-pipe primary loops. Users can easily see the flow and pressure drop on each pump element in the overall network. 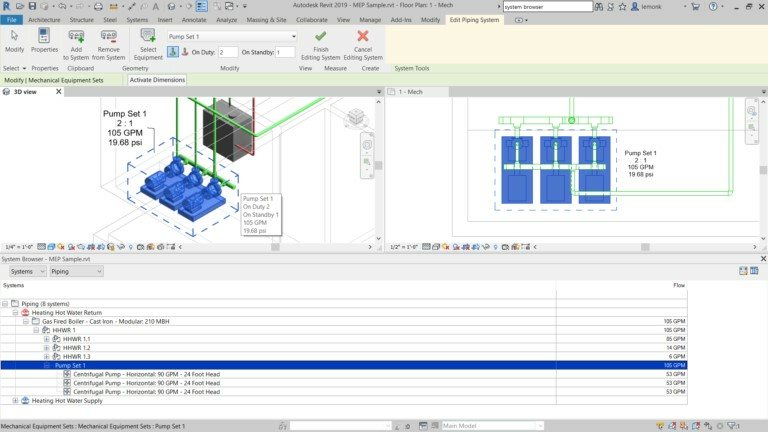 Using Revit 2019, engineers can also set up and analyze pumps in parallel in hydronic piping networks, and easily compute flow from duty and standby pump quantities." Revit 2019 also includes new features for modifying and manipulating structural framing and column elements. 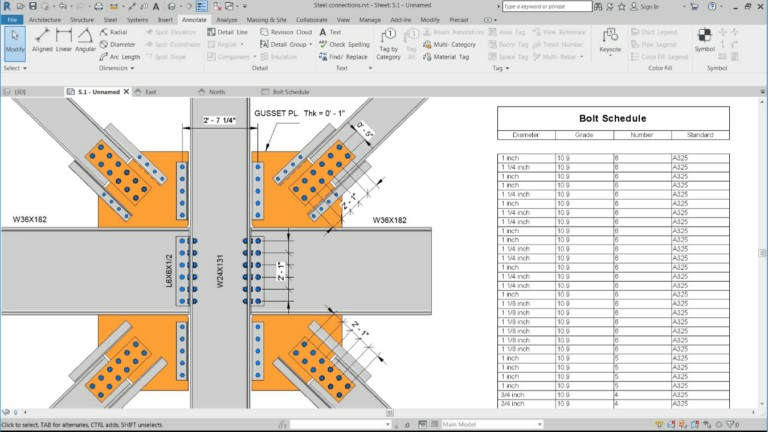 Features include the ability to add plates, bolts, shear studs, anchors, and welds as connections between elements, as well as engineering documentation capabilities to better detail engineer-related requirements, layouts, and communication. There seems to be a good bit of new functionality here that we didn't get time explore, so let us know if you find other significant updates related to steel design in the comments! Scheduling for free-form rebar in previous versions of Revit was always a pain. In other words, you just didn't want to do it. 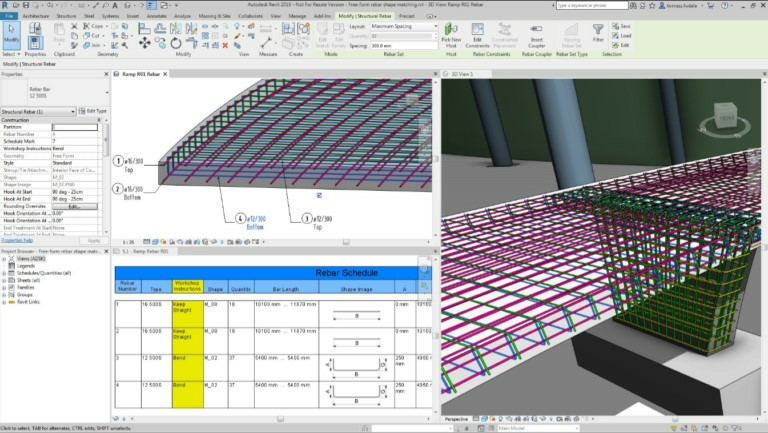 Revit 2019 improves this scenario, adding functionality where free-form rebar will either match existing rebar shape families, OR it will create entirely new rebar shape families based on its geometry, making scheduling and annotation a significantly easier process. Third parties can now leverage the Precast for Revit API for precast automation mechanisms. 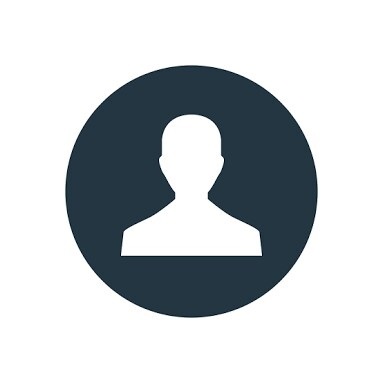 Miscellaneous new additions to Revit 2019 should make it run more smoothly for users in countries like Germany, Austria, and Switzerland. It appears that the main components are new content and multidiscipline workflow capabilities "optimized for use in German-speaking countries." Autodesk calls this "countrification." I don't even think that's a real word. Given the above, our team gives Autodesk a solid thumbs up for Revit 2019. With Revit spanning such diverse applications and users, everyone is going to have pain points that are not addressed in a single update. It’s inevitable. However, given the circumstances and the overall need for improvement after Revit 2018, the crew at Autodesk seems to have managed a quality upgrade from previous versions. Plus, as usual, it's given a few hints at extensions and updates yet to be released (specifically mentioning a Structural Precast Extention), so we can expect more down the road for any immediate gaps we see. All in all, we're happy. What about you? Have you found any significant updates we missed? Let us know! Does Anyone Else Dream About Writing Instruments?